Multiple sclerosis is an autoimmune disease that affects the brain and spinal cord (central nervous system). It affects women more than men. The disorder is most commonly diagnosed between ages 20 and 40, but can be seen at any age. 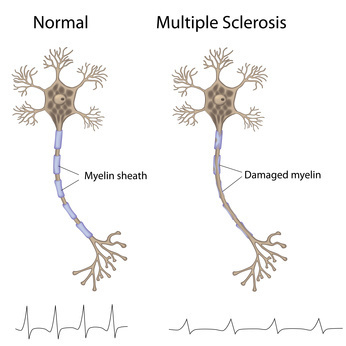 MS is caused by damage to the myelin sheath, the protective covering that surrounds nerve cells. When this nerve covering is damaged, nerve signals slow down or stop. The nerve damage is caused by inflammation. Inflammation occurs when the body’s own immune cells attack the nervous system. This can occur along any area of the brain, optic nerve, and spinal cord. Symptoms vary because the location and severity of each attack can be different. Episodes can last for days, weeks, or months. These episodes alternate with periods of reduced or no symptoms (remissions). Fever, hot baths, sun exposure, and stress can trigger or worsen attacks often. Because nerves in any part of the brain or spinal cord may be damaged, patients with multiple sclerosis can have symptoms in many parts of the body. Chiropractic has historically produced great symptomatic relief for a person suffering with MS, especially low force chiropractic methods, like Torque Release Technique. When the spinal cord becomes overly sensitized due to this condition, all the nerves exiting can be inflamed and cause horrible symptoms. Gentle, specific chiropractic adjustments make a great difference for this population.